You know the old saying that you should write a book that you'd like to read? Well, that was what inspired me to begin seriously writing. I've always been an avid reader and writing simply felt like the next logical step. At present I'm thoroughly enjoying the paranormal genre. It's exciting, fun and totally unpredictable. In the future I may branch out but for now this genre feels like home. Do you title the book first or wait until after it’s complete? I never title a book until after I at least finish my first draft of a manuscript. I need to feel out the story before labeling it. So many, I'm a huge fan of Darynda Jones, Karen Marie Moning and Kresley Cole to name a few. I think every author I read influences my writing in some fashion. I'm re-reading the Sookie Stackhouse series in preparation for After Dead: What Came Next in the World of Sookie Stackhouse releasing on October 29. Warrior Redeemed the fourth book in the Nephilim Warrior Series is due to release on Nov. 29. Sure, I'm currently working on the first in my new YA series Valkyrie Diaries. I wanted to write something for my teenage daughter, a series that she could get into and enjoy. In this series we follow 16-year-old Kylie and her brother Mason as they discover that the veil that separated the human realm from that of the supernatural was compromised exposing them to shifters, slashers, demons and Valkyrie. So far she's loving it! We can't wait to share it with everyone! Elise Michaels' motto has always been: no guts, no glory. She is a thrill seeker, continually craving excitement and adventure. The idea of being tied down to a place or man never interested her, even though a betrothal spell was cast linking her and the Head of Council’s son when they were mere infants. Being a distant third in succession to assume the Head Mistress role, she felt confidant that her secret would remain in her past along with Coven life. Unfortunately, nothing in our fun loving heroine’s future is anything she or anyone from the supernatural realm is prepared for. Now, she’s forced to return to the place and the Sorcerer she so desperately sought to forget. Elise has no idea the power and gifts that await her. Can she let go of her own desires and embrace her new role? Or will she surrender to the faceless evil coming for them all? 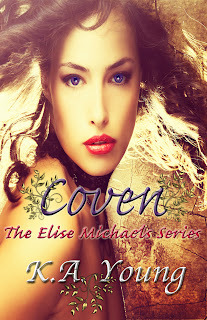 Book one in the tantalizing Elise Michaels Series a spinoff of The Nephilim Warrior Series.